The ultrasonic method presented is able to extract automatically certain parameters of US waves recorded continuously during the setting and hardening of mortar materials. The resulting curves describe the material behaviour and are related closely to the hydration process of the mortar. These curves are linked to the elastic properties and give a comprehensive picture of the stiffening process in a way that was not accessible before. Future applications in industrial laboratories have to show, what kind of benefits are brought up by recording the material properties of suspensions during hardening. Anyway, it is obvious that this technique gives a clearer and more detailed insight than the standard procedures that are measuring only one single parameter at certain stiffness stages. An advanced process technology in the area of concrete quality control needs proper surveillance by reliable and - as much as possible - objective measurements. A possible solution is the ultrasound technique, where amplitude-, velocity- and frequency-variations depending on the age of the material can be observed during the hardening process. The property of cementitious materials are changing from a suspension to a solid during the stiffening process caused by the hydratation of the cement-matrix. Biot's theory (1956) describes the physical properties of this class of materials in an adequate way, as was shown by own measurements. Based on this approach, using wave propagation theory, it became obvious that ultrasound experiments measuring elastic waves in through-transmission are able to characterize the material during the stiffening process (Sayers & Dahlin 1993; D´Angelo et al. 1995; Boutin & Arnaud 1995). Although the whole waveform is representing the material properties, for quantitative analysis techniques some parameters have to be extracted out of the signals recorded by a measuring device. Parameters that are easy to determine are the velocity (extracted by measuring the onset time of the signals knowing the travelpath of the wave) as shown in the graph for different admixtures, the energy (calculating the integral sum of the wave amplitudes) and the frequency content (using Fast-Fourier-Transform techniques). One has to keep in mind that there are, of cause, also several other parameters that can be used. Even though one single wave parameter could be sufficient to characterize the material, the reliability of the method in increased by evaluating more than one. The according instruments or techniques resp. are shown in fig. 1 and fig. 2. Fig 2: Vicat-needle-test for cement paste (left) and the results of a penetrometer-test (after ASTM C-403) for concrete showing the extraction of initial and final setting values (right). It has to be stated that the existing methods are easy to handle and in the low-cost range. The reliability is limited and very close related to the experience of the tester. The range of applications is also limited to some single parameters for material characterization. An advanced process technology needs proper control by reliable and - as much as possible - objective measurements. That is the reason why the ultrasound technique became more and more evidence in this field of non-destructive testing. There are several ways to evaluate the setting process of concrete or mortar with ultrasound. On is the measurement of the energy of waves reflected at the surface of the material (fig. 3a) (Valic; & Stepisnik 1998; Ötztürk et al. 1999). The impedance of the waves is highly correlated to the material consistency. Another technique is evaluating the ultrasound waves in through-transmission (fig. 3b) and will be described in more detail. Techniques using shear waves (Boutin & Arnaud 1995) or any other waves (electromagnetic waves f. i.) or methods are also reported but will not be described here. Fig 3: a) Measuring the energy content of waves reflected at the surface between a well-known dummy material (grey) and the concrete or mortar.b)Measurements with ultrasound in through-transmission using an US emitter and a sensor at the opposite side. The through-transmission technique is recording the waveforms of the emitted signal after their way through the material. The waveform and also the parameters energy and frequency are influenced by the material properties. A continuous measuring as shown in figure 4 is able to illustrate the changes of the waveform during the setting of the material. To see these changes more clearly the signals were normalized in amplitude - the original wave amplitudes are growing rapidly as will be demonstrated in the next chapter. Fig 4: Ultrasonic waves recorded in through-transmission at certain intervals (20 minutes) during the hardening of concrete. 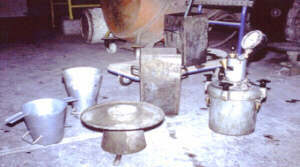 Measurements beginning at 15 minutes after mixing (upper left) and ending at 24 hours (lower right). One of the main parameters used for the evaluation of the stiffness of a material is the US velocity. The velocity of a compression wave through a specimen can be extracted out of the onset time of the signal recorded at the receiving sensor. The onset time can be determined by the operator manually, what is not feasible for a self-running test with durations of hours or even days. Therefore, we developed an algorithm to extract the onset times automatically - the algorithm was called FRESHCON and enables the full-automatic determination of the velocity variations during the setting. An example of the resulting velocity curves for concrete admixed with different quantities of a retarder (Pozzutec 50 G) is shown in fig. 5. The retardation effect is expressed via the different slope of the velocity up to a consolidation value of around 4000 m/s. This plateau is not achieved by a material, where the additive exceeds the permitted value (³ 25 ml/kg). Fig 5: Influence of different quantities of retarder to the velocity of US waves. Similar graphs can be found for all concrete or mortar materials as well as for all admixtures and additives. An example for different kind of admixtures is represented in fig. 6, where the influence of accelerators, retarders and air entrainers are compared to a material without any additive. To enhance the interpretation capabilities additional parameters have to be extracted out of the recorded waves. So far, for the velocities only the very first beginning of the signal is evaluated. Additional informations can be obtained analyzing the change of the signal amplitudes or the frequency content during the setting of the material. The automatic realtime extraction of the velocity as well as of the energy of the signal using the FRESHCON program is shown in fig. 7. For a rapid first interpretation f material properties a full-automatic determination of the initial and final setting time was implemented. Comparing the graphs recorded for different material compositions differences in quality as well as of the workability can be found easily. Fig 6: Influence of different kind of admixtures to the velocity of compressional waves. Fig 7: Evaluation of velocity (straight curve) and energy (dotted) during the hardening of concrete using the FRESHCON software. The initial and final setting time are extracted automatically at 2 h 39 min and 5 h 35 min (Grosse et al. 1999). Following fig. 7 the ultrasound waves travelling through cementitious materials are highly attenuated in the beginning right after mixing. The signal in the hardened state is on the other hand several decades higher in amplitude. Therefore, it is sometimes more useful to focus on the parameter energy for the interpretation of the hardening process than on the velocity. Even more details of the stiffening process can be obtained analyzing the whole waveforms of the signals in time or frequency domain. The properties of cementitious materials are changing from a suspension to a solid during the stiffening process caused by the hydration of the cement-water-matrix. Using Fast-Fourier-Transform (FFT) techniques these changes can be viewed more detailed and comprehensive (fig. 8). At the very early stage after mixing the ultrasound signals are of small-band nature with highest amplitudes in the low frequency range less than 5 kHz. In the first few hours the frequencies getting more broadband and are shifted to a centre frequency of 120 kHz. Main frequencies at the end of this measurement (24 h) occurs between 20 and 200 kHz. Fig 8: Evaluation of the frequencies using an FFT algorithm. Every horizontal line represent the normalized FFT of a signal obtained during the hardening of the material (Reinhardt et al. 1999). Compare figure 4. The above evaluation of the frequency content gives a more quantitative result than the qualitative observation described using figure 4 alone. A more detailed evaluation of these effects is in progress. Using the described approach to material characterization numerous applications can be made. There is a great demand from the design engineer for high-strength concrete, high-performance concrete, fibre concrete; from the contractor for highly workable concrete, self-levelling concrete, slip formed concrete, retarded mixes; there is less workmanship on the construction site available; there is increasing quality required for durable concrete structures in an aggressive environment. For the materials producers the effect of admixtures and additions on the fresh or the hardened state of concrete or mortar is of interest. Other possible applications range from the quality control and time-optimization techniques in concreting factories for finished parts to the control of workability in an cost-effective environment in-situ. The ultrasonic measurement technique presented in this paper is able to extract automatically certain parameters of ultrasound waves recorded continuously during setting and hardening of cementitious materials like concrete or mortar. 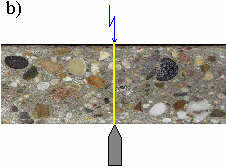 The analyzing techniques including the evaluation of waveform parameters like velocity, energy or frequency describe the material behaviour and are related closely to the hydration process of the mortar. They give a clearer and more detailed insight into the material properties than the standard procedures that are measuring only one single parameter at a certain time. The continuous research activities over the last decade at the University of Stuttgart resulted in an adequate measuring as well as a patent specification which was passed for registration under number 198 56 259.4 to German and European patent offices (1999). The presented work is the result of a co-operative research project. The authors like to thank Alexander Herb, Bernd Weiler, Günther Schmidt, Kai Höfler, Jochen Fischer (1991), Nicole Windisch, Iris Kolb, Jens Bohnert (1996) and Stephanie Köble (1999) for their contributions. Biot, M. A.: Theory of propagation of elastic waves in a fluid saturated porous solid. Low-frequency range. J. Acoust. Soc. Am. 28 (1956), pp 168-178, Higher-frequency range, pp 179-191. Bohnert, J.: Untersuchung der Ultraschallwellenausbreitung in Frischbeton. Diploma Thesis, Geophysical Institute, University of Karlsruhe, Nov. 1996. Boutin, C., Arnaud, L.: Mechanical characterization of heterogeneous materials during setting. Eur. J. Mech., A/Solids 14, no. 4 (1995), pp 633-656. D´Angelo, R., Plona, T.J., Schwarte, L.M., Coveney, P.: Ultrasonic measurements on hydrating cement studies. Advanced Cement Based Materials 2 (1995), no. 1, pp 8-14. Grosse, C., H.-W. Reinhardt: Continuous ultrasound measurements during setting and hardening of concrete. Otto-Graf-Journal 5 (1994), pp 76-98. Grosse, C., H.-W. Reinhardt: Entwicklung eines Algorithmus zur automatischen Lokalisierung von Schallemissionsquellen. Die Materialprüfung 41 (1999), pp 342-347. Fischer, J. C.: US-Messungen an Frischbeton. Diploma Thesis, Institute of Construction Materials, University of Stuttgart, Oct. 1991. Herb, A.: Frischbeton: Korrelation zwischen Ergebnissen klassischer Konsistenzmessungen und Ultraschall-Verfahren. Diploma Thesis, Institute of Construction Materials, University of Stuttgart, Oct. 1996. Öztürk, T., Rapoport, J., Popovics, J.S., Shah, S. P.: Monitoring the setting and hardening of cement-based materials with ultrasound. Concrete Sci. and Eng. 1 (1999), No. 2, pp 83-91. 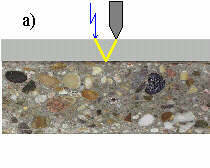 Reinhardt, H.-W., C. Grosse: Setting and hardening of concrete continously monitored by elastic waves. Proc. of the Int. RILEM Conference "Production methods and workability of concrete", Paisley/Schottland (1996), pp 415-425. Reinhardt, H.-W., C. Grosse, B. Weiler, J. Bohnert, N. Windisch: P-Wave propagation in setting and hardening concrete. Otto-Graf-Journal 7 (1996), pp181-189. Reinhardt, H.-W., C. Grosse, A. Herb, B. Weiler, G. Schmidt: Verfahren zur Untersuchung eines erstarrenden und/oder erhärtenden Werkstoffs mittels Ultraschall. Patent pending under no. 198 56 259.4, Deutschen Patentamt, München (1999). Reinhardt, H.-W., C. Grosse, A. Herb: Kontinuierliche Ultraschallmessung während des Erstarrens und Erhärtens von Beton als Werkzeug des Qualitätsmanagements. Hefte des Deutschen Ausschusses für Stahlbeton (DAfStb) 490 (1999), pp 21-64. Sayers, C. M., Dahlin, A.: Propagation of ultrasound through hydrating cement pastes at early ages. Advanced Cement Based Materials 1 (1993), no. 1, pp 12-21. Valic, M. I., Stepisnik, J.: An ultrasonic shear wave apparatus and its applications in material research. In: Proc. 34th Int. Conf. MIDEM, Rogaska Slatina 1998, pp 65-70.